NGSS workshop participants work in groups to gain a better understanding of the practices and learn how to implement them in their own classrooms. 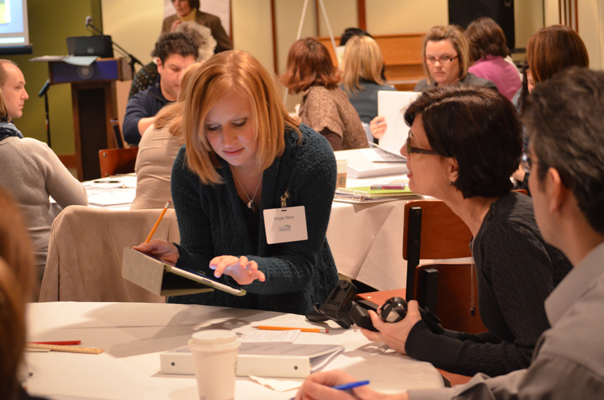 On Friday, January 25, Aurora University hosted Understanding and Implementing Next Generation Science Standards, a workshop for area elementary, middle and high school teachers. The workshop was designed by experts in the Next Generation Science Standards (NGSS) and facilitated by educators that have undergone training in implementation of these standards. NGSS is an initiative led by the National Research Council, the National Science Teachers Association, the American Association for the Advancement of Science and Achieve that focuses on developing K–12 science standards across all disciplines and grades with the goal of providing all students an internationally-benchmarked science education. Approximately 60 local educators and community partners attended the workshop, where they were introduced to the Science and Engineering Practices of the proposed NGSS. Strong focus was placed on the new standards to give educators a better understanding of the practices and train teachers on how to implement them in their own classrooms. Throughout the workshop, participants worked in groups to explore possible avenues to implement the practices into their classrooms, and collaborated to understand the vertical alignment and sequencing of the science curriculum.